Change is occurring at breathtaking speed, and it is accelerating at an unprecedented rate. This fact can be seen as exciting, powerful, wonderful, confusing, or terrifying. It all depends on your point of view. Yet who among us has received as much instruction on dealing with ever-accelerating change as we have on tying our shoes? Its never really mattered before, because it has never happened before, not with todays intensity. It is up to each one of us to educate ourselves on how to adapt to this irresistible force: the acceleration of change. The first big question is simply where to begin. “It is the thesis of this book that there are discoverable limits to the amount of change that the human organism can absorb, and that by endlessly accelerating change without first determining these limits, we may submit masses of men to demands they simply cannot tolerate. We run the high risk of throwing them into that peculiar state that I have called future shock. One of the difficulties in adjusting to the new rate of change lies in our ability to anticipate future events and trends accurately enough to keep them from overwhelming us when they arrive. We have all developed a certain amount of skill at predicting emerging events, some of us more so than others. Yet whatever skills we may have acquired, whether great or small, are almost always dependent on one assumption that is usually quite invisible, because it has always been true. It is that change occurs in a slow and linear way. In other words, the degree of change of something in one year (or even one century) is about the same as it was in the last similar period. This assumption has been quite reliable for centuries. But not anymore. Perhaps never again. It should come as no surprise, then, that in recent years the word “disruptive” has come into common usage to describe an innovation whose effect on the status quo is so powerful, so profound, and so immediate, that it utterly disrupts the established order. Though some natural disasters have had such an effect, at least regionally, in the past, a global disruption has not occurred suddenly since 65 million years ago when a projectile from space hit the Earth causing a night that lasted long enough to wipe out the dinosaurs. Yet never before, since the first ape walked upright have we or any of our ancestors done anything that had the profound and immediate impact on human life that technological innovations have today. The atomic bomb was probably the first; not so much its existence, but its actual use. Is it any wonder, then, that we have had to press into service an old and well-used word to describe something that has never before happened. And that may be the most telling evidence of all that the times aren’t the only things that are a changin’. We have seen in the last century more innovation, more changes in the very nature of what it is to be human, than have been witnessed by humankind in the last millennium. Maybe ever! We have seen the spread of democracy, the industrialization of nearly the whole world, and advances in transportation, communication, and science that are nothing short of miraculous. And dont forget sending men to the Moon. You may have also noticed that the pace has been steadily picking up. The changes in this new century have already outstripped those of the previous half-century, which in turn dwarfed those of its predecessor. The next decade will see changes greater than those in the last quarter of a century. If you are familiar with Moore’s Law (see Chapter 36 if you’re not), you know the kind of beast we are dealing with here. Briefly, it predicts that the number of transistors that can be placed on a chip will double every two years. Moreover, the actual computational speed has been doubling every 18 months, due to the fact that in every succeeding generation of chips, each transistor can do more work per unit time. This has been true with almost mathematical precision for nearly half a century now. However, the current trend is to reduce the doubling time to twelve months. In other words, there is constant and powerful pressure to increase the rate at which the technology evolves. In some areas (e.g., hard disk technology), it has already been shortened. This same type of process is active in virtually every facet of human experience. The doubling time may vary from situation to situation, but in any given area, it tends to remain more or less stable. And it produces constant acceleration! So, what can we, as mere mortals, do to prepare ourselves for this onslaught from the future? Our future. 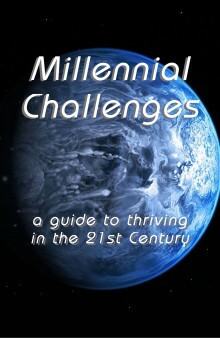 This book is an attempt to provide you with insight into many of the areas in which we will, as humans, be facing the greatest challenges in the coming decades. The full gamut of possibilities has been separated into ten major categories, and within them, ten specific challenges of which we should be aware. Certainly some of these challenges will be far more significant to you than they are to others, and vice versa. Even so, it is good to at least be aware of the lay of the land, even in those areas that don’t seem to matter to you today. You may find later that they come to matter a lot more than they seem to today. Considering the pattern of change already present, a smart person would expect more of the same. Though every effort has been made in the writing of this book to ensure that it is factually accurate, and conceptually sound, it could never be perfect. This is true if only because the reality will have changed before you have had a chance to read it. Still, it should offer you a good, solid foundation from which to navigate your way through the constantly moving landscape of twenty-first-century life. And that is the most sincere wish of all involved in its creation. Our first major subject category involves the challenges we all face that are of a personal nature. After all, charity isn’t the only thing that begins at home. Where do you want the instructions for your free download sent?